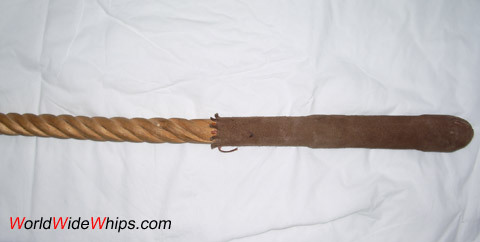 An animal trainer made this whip for his personal use. Its strong twisted willow crop has been balanced by lead wrappings under the handle. The handle itself has been covered with leather sewn around with the "furry" side out to provide a comfortable grip. The thong is made of two thick layers of leather, sewn together and rounded. Dimensions: 3.5 ft crop / 1.25 in. handle diameter, 6ft thong plus 2.5ft cracker.